Carbon foam: The key ingredient of a better battery? Michigan Tech researchers are using carbon foam to develop greener, ultra-long-life batteries. 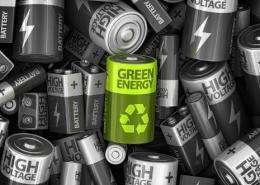 (PhysOrg.com) -- A lighter, greener, cheaper, longer-lasting battery. Who wouldnt want that? Researchers at Michigan Technological University are working on it. Actually, their design is a twist on whats called an asymmetric capacitor, a new type of electrical storage device thats half capacitor, half battery. It may be a marriage made in heaven. Capacitors store an electrical charge physically and have important advantages: they are lightweight and can be recharged (and discharged) rapidly and almost indefinitely. Plus, they generate very little heat, an important issue for electronic devices. However, they can only make use of about half of their stored charge. Batteries, on the other hand, store electrical energy chemically and can release it over longer periods at a steady voltage. And they can usually store more energy than a capacitor. But batteries are heavy and take time to charge up, and even the best cant be recharged forever. Enter asymmetric capacitors, which bring together the best of both worlds. On the capacitor side, energy is stored by electrolyte ions that are physically attracted to the charged surface of a carbon anode. Combined with a battery-style cathode, this design delivers nearly double the energy of a standard capacitor. Now, Michigan Tech researchers have incorporated a novel material on the battery side to make an even better asymmetric capacitor. Their cathode relies on nickel oxyhydroxide, the same material used in rechargeable nickel-cadmium or nickel-metal hydride batteries. In most batteries that contain nickel oxyhydroxide, metallic nickel serves as a mechanical support and a current collector, said chemistry professor Bahne Cornilsen, who had been studying nickel electrodes for a number of years, initially with NASA support. A few years ago, the Michigan Tech team had a chance to experiment with something different: carbon foam. He suggested replacing the nickel with carbon foam. Carbon foam has advantages over nickel. Its lighter and cheaper, so we thought maybe we could use it as a scaffold, filling its holes with nickel oxyhydroxide, said Tony Rogers, associate professor of chemical engineering. But how many times can you recharge their novel asymmetric capacitor? Nobody knows; so far, they havent been able to wear it out. Weve achieved over 127,000 cycles, Rogers said. Other asymmetric capacitors have similar numbers, but none have the carbon-foam edge that could make them even more desirable to consumers. Being lighter would give it a real advantage in handheld power tools and consumer electronics, said Rogers. Hybrid electric vehicles are another potential market, since an asymmetric capacitor can charge and discharge more rapidly than a normal battery, making it useful for regenerative braking. Wouldn't this hybrid battery be called a bacitor? "Combined with a battery-style cathode, this design delivers nearly double the energy of a standard capacitor." So, way below a battery. Incidentally; 127,000 cycles is just minutes in operation when you use the capacitor in a SMPS device. The lifetime of capacitors isn't measured in cycles because they have to last trillions of them. Firefly (a Caterpillar spin-off) was working with carbon foam for lead-acid batteries. Unfortunately, they ran out of money right when they were field testing the technology. There's some energy density for you. Once you have read this site and the likes of it for some 5 years, you'll notice that if all of the amazing, ground breaking, mind defying, and reality challenging articles you see here several times every week, were true, then we'd today have batteries that charge in minutes and last for weeks, solar cells that can supply an entire city with merely the shine of the moon, and fusion reactors that actually are within a decade from today. Those more jaded might read this article as yet another carbon foam anode invention, most of which have invented the same idea: increase the surface area. Caps and batteries work comp[letely differently and those differences preclude them working together. Anyone saying otherwise is either a con or conned. Nor is this the first carbon foam battery like Cat Firefly and similar CF batteries, none of whichj has worked well enough to produce,. just to con money from investers. Ive read these articles for longer than 5 years and the businesses that market products have to milk us for 50 years before any of these technologies ever get into the hands of the consumer. What kind of battery manufacturer would want a battery that is cheaper and results in significantly fewer sales? What kind of battery manufacturer would want a battery that is cheaper and results in significantly fewer sales? The kind that wants to grab customers from the one that makes the expensive batteries? Plus, you're forgetting that lowering the price would see more, not less customers, as the batteries find more uses than before since they're more affordable. So how is this different from an electrolytic capacitor, other than upgrading the carbon electrode?